Ex 14.3, 4 State whether the “Or” used in the following statements is “exclusive “or” inclusive. Give reasons for your answer. Sun rises or Moon sets. We know that Sun rises in morning . At the same time ,moon sets Hence both can happen simultaneously Hence it is inclusive (However in NCERT Answer, it is mention that it is exclusive definition i.e. 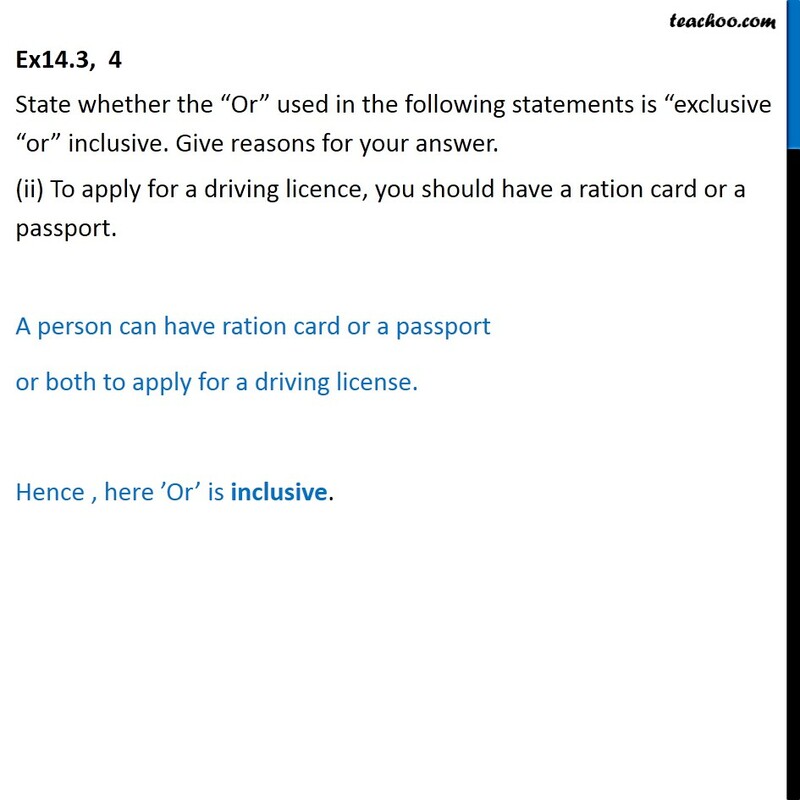 either of 2 is possible) Ex14.3, 4 State whether the “Or” used in the following statements is “exclusive “or” inclusive. Give reasons for your answer. (ii) To apply for a driving licence, you should have a ration card or a passport. A person can have ration card or a passport or both to apply for a driving license. Hence , here ’Or’ is inclusive. Ex14.3, 4 State whether the “Or” used in the following statements is “exclusive “or” inclusive. Give reasons for your answer. (iii) All integers are positive or negative. All integers either positive or negative but cannot be both. Hence, here ‘Or’ is exclusive.